Kia has sold over 15 million sports utility vehicles and minivans worldwide, the carmaker said on Sunday. Kia reached the milestone in about three decades since its first SUV, Rocsta, was released in 1990. "The cumulative sales of our recreational vehicles have now exceeded 15 million, given that we sold 14.96 million RVs last year and the average monthly sales in the first quarter was around 110,000 units," a Kia spokesman said. Some 11.70 million units, or 78 percent, were sold overseas. Kia achieved the sales feat mainly due to its three best-selling models -- the Sportage compact SUV, Sorento midsize SUV and Carnival minivan. The combined sales of the three stand at 10.87 million, accounting for 72 percent of its total accumulated RV sales. The carmaker recently launched its biggest eight-seater Telluride SUV and a revamped version of the compact Soul SUV in the U.S. to capitalize on the growing demand for RVs there. 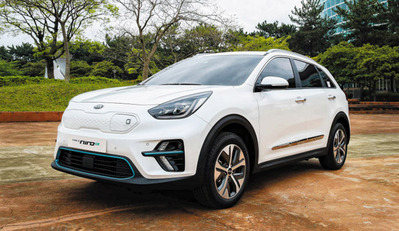 Kia's Niro Hybrid SUV Sets Fuel-Efficiency Record in U.S.